The third Annual Rusty Rolls 5k Race / Walk is scheduled for Sunday, May 5th at 9:00. Start and finish is at Crosby Field at the Foreside Recreational Facility in Topsham. This race has become a must-do community event. It has become more popular each year with more than 160 runners participating last year. The race is the brain child of Rusty Wilkins and his cousin James Anderson. Rusty is a 2017 graduate of Mt Ararat. He has cerebral palsy and is confined to a wheel chair,. He communicates through his laptop. His cousin James was a standout Cross Country and distance runner at UNH. After he graduated, he suggested to Rusty that they form a running team in the mode of Team Hoyt ( http://www.teamhoyt.com/ ). Rusty was all in immediately. In the last three years, Rusty and James have competed in countless 5 and 10K races as well as 5 marathons, including the Marine Marathon in Arlington VA twice. If you have ever been to a Mt Ararat Basketball, Baseball, or Field Hockey game, you've probably seen Rusty cheering on the sidelines. This year, Emma Skelton, a senior at Mt Ararat, has undertaken the role of Race Director as part of her Senior Capstone project. She got special permission to change the date to May 5th, which makes the race a little more friendly weather-wise. She also has engaged a list of entertainers to perform before, during, and after the race. Mike Crawford will be playing the bagpipes. Local band Astral Pines featuring MTA grads Kellen Radulski and Sam Stride will be performing along with a trio of MTA freshman. Rusty's Market will be providing free pizza and drinks. Somewhat unfortunately (for us), Rusty's cousin James has moved to a new job in Redmond, CA. He will still be racing with Rusty with an aggressive schedule of east coast races including scheduled appearances at the BAA 10K, the Finish at the 50 (Patriots), Run to Home Plate (Red Sox), the Beach to Beacon, and a September, yet to be determined, marathon. 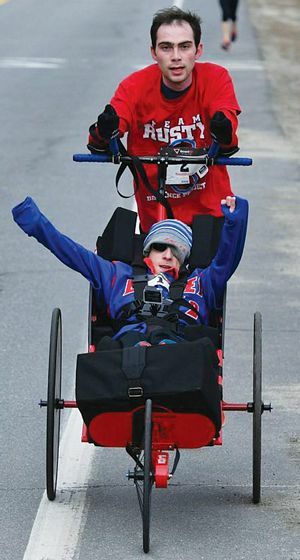 To fill the void, members of the Mt Ararat Baseball team, who have run together in the two previous races, will share duties of pushing Rusty to the finish line as a team. Hunter Lohr, a member of Mt Ararat's baseball team said "This will be our third year participating in the Rusty Rolls 5K Race. It's been a great experience for our team. In the past, we've run as a team. The race has helped to build team camaraderie, but this year will be special for us. We will take turns pushing Rusty toward the finish line. We will not be as fast as his cousin James is, but it will give us a chance to say thank you to Rusty for his undying support for all MTA sports, and especially for the Baseball team. Teammate Austin Damon says "I've never been known for my speed and this is the only race I have ever run. But Rusty has supported us for all my four years. He has given us much more than we have given. This is a great way to to pay him back." In lieu of prizes for top finishers, local businesses have donated more than 25 gift cards worth more than $500 that will be awarded randomly based on bib numbers so every one has a chance to win. Mt Blue's Macey Phillips and Ace Provencher hit back to back homers in the first inning to give the Cougars an early lead. The Eagles battled back, bu their sixth inning rally fell a little short. Megan Reed was on the bump for the Eagles. She struck out the first two batters she faced, but Mt Blue's Phillips and Provencher deposited the next two pitches into the snowbanks that rimmed the outfield in left center field. The Eagles got one run back in the bottom of the frame. Bella West reached on the first of her three walks in the game and advanced to second on a single by Jaden Lohr. Emily Wormwood worked a walk to load the bases. Camille Rowe slapped a hard shot to the right side of the infield. The Cougars second sacker Wylie Post knocked the ball down with a diving stop, but couldn't recover quick enough to throw out the speedy Camille. Camille's hit knocked in Bella West and Jaden Lohr was running the bases aggressively. She came barreling home all the way from second trying to score all the way from second base, but the a perfect throw nailed her on a close play at the plate. The Cougars continued to peck away when they took advantage of three free passes and scored three runs in the top of the 3rd with only one hit. The Cougars again benefited from a pair of walks and increased their lead to 7-1 in the fourth. The Eagles bats went limp through the middle innings with Megan Reed collecting the only hit. Meanwhile the Eagles pitching settled down. Megan Reed and Gabby West held the Cougars scoreless allowing only one hit and no walks through the final three innings. The Eagles' bats came alive in the bottom of the sixth with a three-run outburst. Gabby West led off with a single, but had to leave the game with a pulled muscle. Megan Reed came bask into pinch run and immediately was thrown out trying to steal second. Bre Hunter re-started the rally with a walk and Amanda O'Reilly was hit by a pitch to place runners on first and second. Bre McCourt delivered a solid single to load the bases and "No Probl-Ema" Hawkes drove in a run with a single. Bella West drove in a run with long sacrifice fly to deep right (Mt Blue's right fielder made several nice catches. Jaden Lohr laced a sharp hit to left to plate another run before the Eagles rally ended. In the bottom of the seventh, Camille Rowe, who had four good at bats with only one hit to show for it, lined a shot to right, but once again the right fielder made a nice catch. NOTES: Bella West moved in from left field to catch her sister Gabby in the sixth inning, who recorded a 1-2-3 inning featuring a nasty curve ball. Sydney Mason made a great running, back-handed catch in the seventh inning in right field. Jaden Lohr played a slick shortstop with several nice plays. MLB has James "Big Game" Shields, but MTA goes one better with "Big Game" Hunter Lohr. Hunter pitched a prototypical Luis Tiant-like game, seemingly getting into trouble, but then twisting and turning his way out of trouble. He ended up with 14 Ks and allowed only four hits. The Eagles provided all the support Hunter needed in the third inning when Austin Damon delivered a key RBI double and Devin Tobin followed with an RBI on a fielder's choice to extend the Eagles lead to 2-0. The Eagle added to their cushion when Brady Damms-Mitchell came around to score on a wild pitch after balsting a double to right. Meanwhile, Hunter Lohr was dominating the mascotless Skowhegan team through innings two through five. The Eagles picked up an insurance run in the sixth when Cody Clark singled home Trey Booty, who had doubled. Fireballer Ben Freeman came on with two out and the bases loaded in the top of the 7th and nailed the save with a strikeout. It was a Mad, Mad, Mad game as Maddi Kinney, Maddie Daulerio, and Maddie Horrocks combined to score 8 of the Eagles 13 goals. Freshman goalie Amanda Pickens was solid in net for the Eagles with many key saves early in the game. The Eagles set the tone early when Hannah Huston scored on a free position shot two minutes after the opening face-off. A minute later, freshman Amanda Pickens strutted her stuff when she when she stuffed a Lawrence attacker in close. The Eagles continued to control play and they spread the scoring around with Maddie Horrocks, Maddie Kinney, Jess Cloutier, and Erin Harty all rattling the back of the net to give the Eagles a comfortable 5-0 lead. The Bulldogs got on the board with 7:41 left in the half, but the Eagles Mad contingent put the Eagles offense back in gear. First, Maddi Kinney scored off a Maddie Daulerio feed; then Maddy Daulerio finished a pretty fast break converting a Maddi Kinney pass to make it 7-1; finally, Maddie Kinnie struck again converting a Maggie Libby pass to make it 8-1 with less than two minutes in the half. As the clock ticked down, Lawrence had a good chance, but Amanda Pickens batted the shot away just before the buzzer sounded. The Eagles continued to dominate in the second half. Jess Cloutier moved in front and scored on a shot from the slot. Maddy Daulerio and Maddi Kinney worked a nice weave on the fast break with Kinney finishing to make it 11-1. Reese Turcotte moved up from her defensive position, anticipated a pass, made the interception and burst in for a shot that was saved. After Lawrence staged a mini comeback with two goals, Maddi Kinney struck again. She broke up a clearing pass and quickly pivoted and shot to beat the Lawrence goalie. Jess Cloutier closed out the scoring when she converted a Maggie Libby pass from behind to make it 13-4. It was a solid performance for the Eagles. The offense looked sharp and the defense led by Brennan Thiboutot, Alyssa Dau, Reese Turcotte, and Eliza Libby were strong on D and Amanda Pickens looked cool as a cucumber between the pipes for the Eagles. Top scorers for the Eagles were Maddi Kinney with 5 goals and 2 assists, Jess Cloutier with 3 goals, and Maddy Daulerio with two 2 goals and 3 assists. Erin Harty, Maddy Horrocks, and Hannah Huston each scored a goal and Maggie Libby picked up a pair of assists.